Utility Water Equipment | Leak & Pipe Detection | Arthur D Riley Co. Ltd. Developed especially for leak detection on underground pipes by using tracer gas. It is characterised by an outstanding price to performance ratio. Using tracer gas is a tried and tested method of pinpointing leaks. It can be used in gas and water distribution networks, pipelines in buildings, heating systems, pressurised communication cables, gas-filled high voltage power lines and landfill sites sealed with double membrane layers. It can also be used to test for leaks in industrial products such as pipes, pumps, engine blocks and airfoils. It is is an electronic listening device for recording and amplifying structure-borne sound oscillations of whatever kind. The new oscillation sensor ensures undistorted sound reproduction even when the noise is barely audible. The filter adjusts the sound emission of the device to the hearing properties of the users. At the same time, certain sounds are noticeably emphasised (e.g. deep-pitched sounds of plastic tubes, high-pitched sounds of steel pipes). The operator hearing protection function automatically ensures that the headphone is muted when loud noises suddenly arise. To simplify localisation, the digital display enables the sound intensity at a number of monitoring points to be objectively compared. 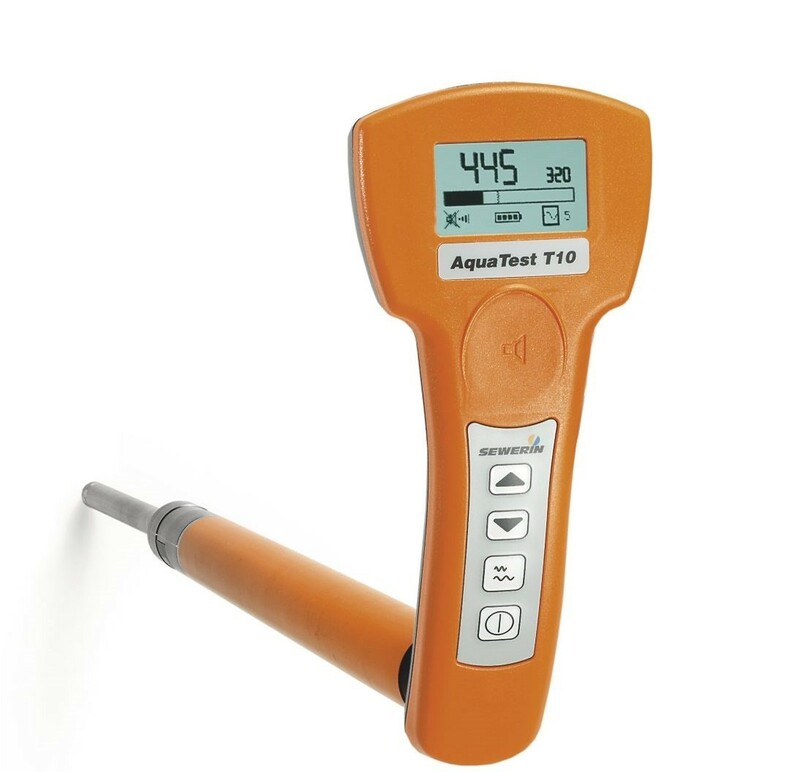 The AquaTest T10 is a test rod with innovative technology and ergonomic design. Its strengths lie in the prelocation of leaks in water pipe networks. 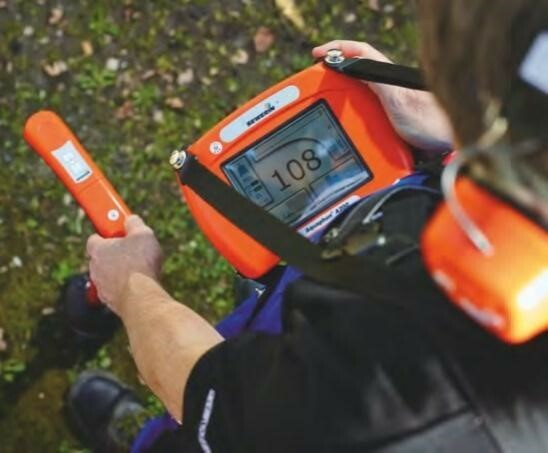 The AquaTest T10 is the first test rod from SEWERIN for which no additional receiver is necessary. Listening to the noises is activated not by the usual key but by a special sensor field. The visualisation of the noises that are picked up is delivered to a display incorporated in the handle. In the product variant with the SDR radio module, the test rod can be used with the radio headphones. 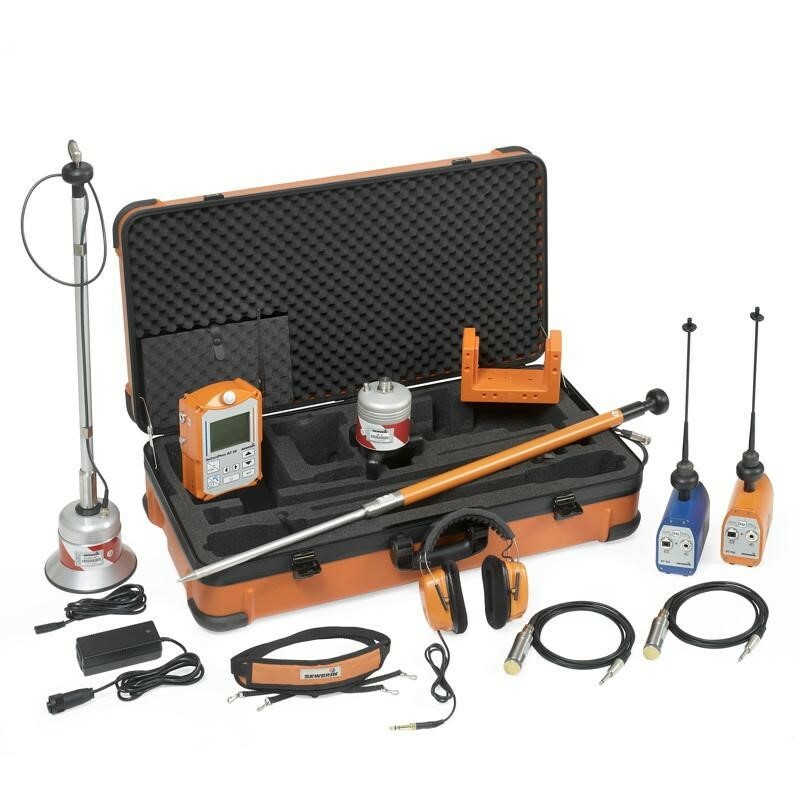 Leak detection by correlation involves locating the leak with the help of a calculator. The noise emitted by a leak reaches two measuring points at different times. 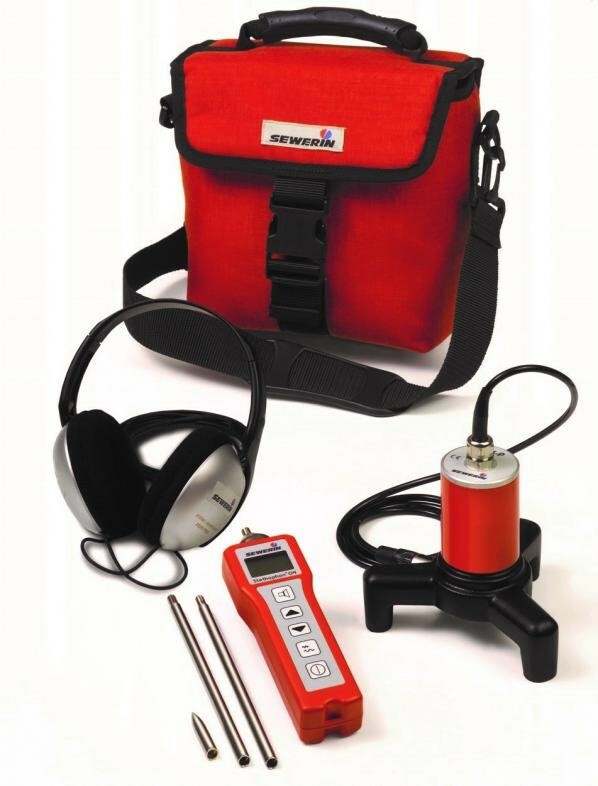 Electro-acoustic water leak detection involves identifying the general area of the leak with the test rod as a preliminary step and then locating its exact position with the ground microphone. 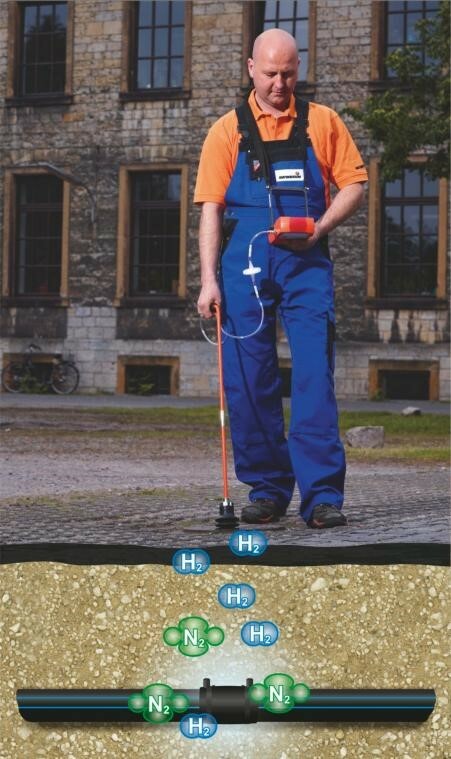 Using the ground microphone at regular intervals enables the leak to be located with sufficient accuracy for confident excavation. the SeCorrPhon AC 06 displays a precise optical comparison of the noise intensities. 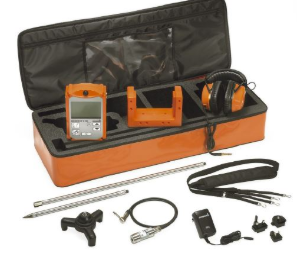 The Aquaphon A100 Plumbers kit is ideal for leak detection. By utilising specialised acoustic technology this equipment locates water leaks by picking up vibrations transmitted by piping systems. This 'noise' is heard by the Aquaphon A100 ground microphones and the digital value for noise is displayed on the LCD screen. The difference in intensities of sound as you move along the pipeline will sufficiently pin point the location of the leak.